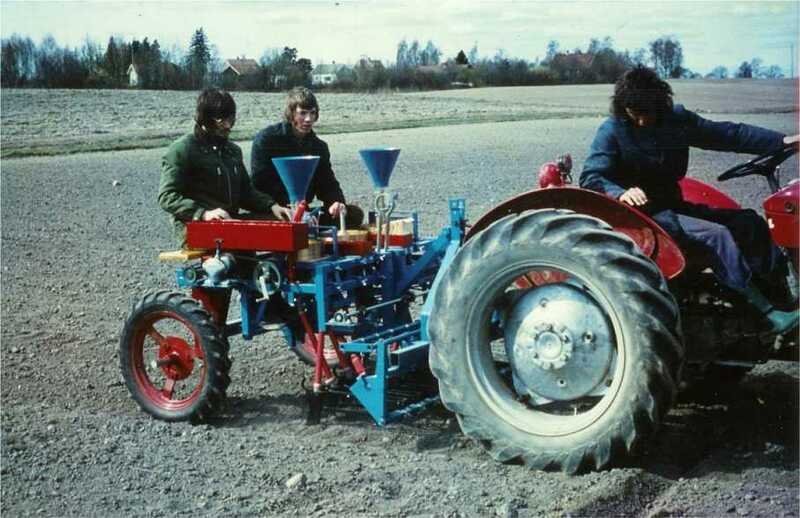 Øyjord’s 2 x 4 rows tractor-mounted double-capacity plot seeder was constructed in 1974 at Øyjord Research Laboratory, Jens A. Schou Mek. Verksted, Drøbak. The picture is taken at the Department of Plant Culture, Norwegian University of Life Sciences (NMBU), Ås. Two persons operate the machine, but one person can also operate it in addition to the tractor driver. On the drill Oleif Elen (left) and Jan Stølen. Kjell Jeksrud runs the tractor. The capacity of the machine is approx. 400-500 plots/hour. It is 40-50 times larger than what three men could handle with the handcrafted Pracner, which from 1914 in Norway was used in the drilling of grain plots. Pracner was used in Norway until 1961 when Øyjord’s four-rows plot seeders with two people ten-doubled the capacity of Pracner.